Carpet flooring remains the most popular choice of floor cover for homes throughout America. It is uniquely suited to a variety of applications, and this flexibility is matched by an affordability that can’t be beat. 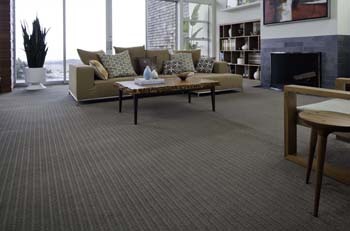 Carpet installation is straightforward and easy, and a well-chosen carpet will enhance a room for years, even decades. Come into our flooring warehouse today and talk to an expert about the many advantages of carpet floors. As a member of a nationwide flooring cooperative, our local retailer takes advantage of this collective buying power to provide wholesale flooring prices directly to the consumer. We back our low prices with a Price Protection Guarantee. In the unlikely event that you find a lower price on the same brand and style of carpet flooring within 30 days, we will refund the difference in purchase price. This gives our customers the peace of mind that they’ve found the best possible deal on their new floors. The affordability of our carpeting does not sacrifice the essentials. Not only is long-lasting carpet appropriate for almost any room, it is also the most flexible flooring material. Your new carpet installation can be in any of hundreds of different colors and patterns, and the right type of carpeting can accommodate any style and existing décor. To help you choose from our more than ten thousand flooring options, we have developed the Five Star Selection System. This system rates each of our carpet floors by length of warranty, allowing you to choose the right level of protection within your budget. Your carpet purchase is guaranteed to look great with our in-home installation, and our team of experts is available on your schedule to get the job done right the first time. Our local company hires courteous local installers to perform fast, accurate carpet installation with a 100% satisfaction guarantee. Talk to us today about the perfect carpet flooring for any room in your home. Not every house is alike, which is why Flooring America by CarpetSmart carries infinite carpet options, whether you’re trying to find a certain bold color or a special type of fiber. During a consultation, we’ll help you determine characteristics of carpeting that are necessary for you to have. We’ll be your guide as you consider sizing and pricing. Matching clients with carpeting that complements your home is our job! We are committed to improving the look of your home. Call <PHONE> or come in today to get guaranteed carpet flooring on any budget! We proudly serve the communities of Springdale, Fayetteville, Lowell, Cave Spring, Siloam Springs, Farmington, West Fork, Gentry, Johnson, Goshen, Huntsville and the entire Northwest Arkansas Region.